Time and again in recent years, Green IT Solution has been able to help out with donations where assistance was urgently needed. As a green IT specialist, one thing has been a particular point of honour for us: providing help with donated hardware. Before Christmas, we were able to support a very special organisation with a laptop donation to the hospice service HosDiAm e.V. Voluntary organisations have a particularly hard time of it when it comes to everyday work. Funds for equipment and hardware are usually limited. HosDiAm also had to make do with a hopelessly-outdated computer for a long time – failures and technical glitches included. So they came to us for help. No sooner said than done! Just before Christmas 2017 we presented the charity with a new, fast and fully-equipped laptop. Considering the valuable work performed every day by HosDiAm, our donation is only a small gesture. But one which makes the volunteers’ everyday work much easier. 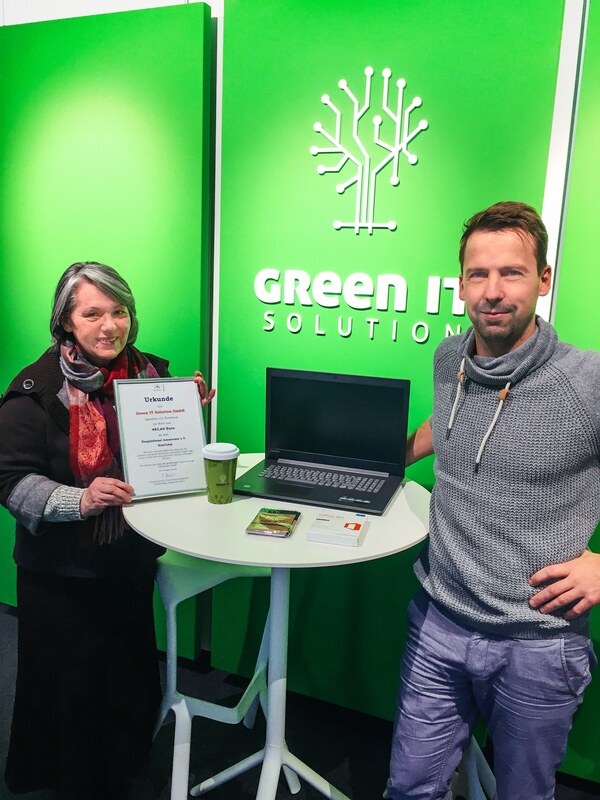 Irmgard Schleich, the coordinator, came to our Ammersee office to pick up the donation. She really impressed our team with her strong, yet sensitive personality. Ms Schleich told us about the charity’s day-to-day work in end-of-life care. HosDiAm supports terminally ill adults, children and young people in their last days, weeks and months – sometimes even years. At the same time, the charity also supports grieving relatives. Here the bereaved receive comfort and support in coming to terms with their loss and in phases of hopelessness. Furthermore, HosDiAm is also actively involved in working with the elderly. The carers for terminally ill patients travel throughout almost all of southern Bavaria. They provide support in the home for outpatients, often working on call. They work closely with the attending doctors, regional care workers, pastoral carers, and of course with the relatives. The charity’s vision for the future is a „hospice hostel”, offering a protective environment for the dying and their families. A place to be together, to provide care and support in the last phase of life. To do this, the charity needs help. Every donation is welcome!